Dec 6, 2018 - LINCOLN, Ala.
More than 1,500 associates at Honda Manufacturing of Alabama, LLC (HMA) today celebrated the start of mass production of the all-new 2019 Honda Passport SUV. Going on sale early next year, Passport is produced exclusively at HMA and will play an important role in Honda's award-winning SUV lineup, providing a unique combination of on-road driving refinement and off-road adventure capability. "Today, we celebrate the dedication of our Honda team in Alabama in delivering this new, adventure-ready sport utility vehicle to our customers," said Mike Oatridge, vice president of HMA. "I congratulate all of our associates for their commitment to our customers as we begin production of the new Passport, which is Honda's most rugged light truck model with features that deliver more of what today's adventurous customers want and need." The Passport was revealed last month at the Los Angeles Auto Show, and will slot between the compact CR-V and three-row Pilot in Honda's award-winning SUV lineup. "The positive response to Passport really signals Honda is poised to compete in this segment," said Lara Harrington, Chief Engineer and Passport Development Leader. "I think we are hitting the market at just the right time for this vehicle. 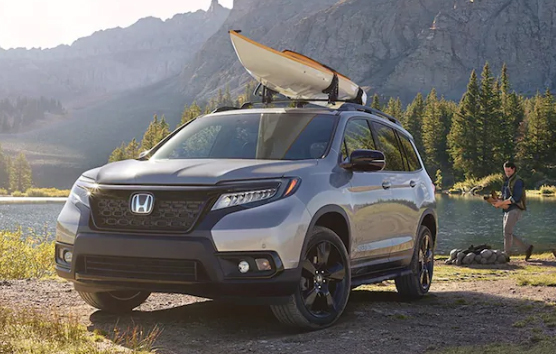 The Honda Passport is designed to bring a more personal, rugged and off-road SUV to our award- winning light truck lineup and we are all excited to see where this new product will take us." The Passport is produced in Alabama alongside other members of the award- winning Honda light-truck lineup, including the Pilot sport utility vehicle, the Odyssey minivan and the innovative Ridgeline pickup truck. The existing lineup of Honda SUVs – Pilot, CR-V and HR-V – has been recognized as the "Best SUV Brand" by U.S. News & World Report for four consecutive years. The Ridgeline was selected as the 2017 North American Truck of the Year. Passport, the newest addition to the Honda SUV lineup, is based on Honda's Global Light Truck platform and shares much of its underlying structure with the three- row Pilot SUV and Ridgeline pickup, including a highly rigid unibody construction. Honda Manufacturing of Alabama (HMA) is Honda's leading light truck production facility employing more than 4,500 associates. HMA has the capability to produce more than 340,000 vehicles and V6 engines each year. Since the start of production on Nov. 14, 2001, HMA has built more than 4.7 million vehicles and engines. HMA's capital investment totals more than $2.6 billion at its 4.6 million square foot facility in Lincoln, Alabama.